Suman Mokhtarian doesn’t sleep. Well, at least that appears to be the case, since any time an email goes out to the Aussie rep on season 27 of The Ultimate Fighter, a response is fired back within minutes. But seriously, when does he sleep? “When the work is done,” he laughs. The work is rarely done for a 25-year-old prizefighter, but when that prizefighter is a head coach and owner of the Australian Top Team gym and the promoter and matchmaker for the Urban Fight Night promotion, that whole no sleep thing gets taken to an entirely new level. So much so that despite a perfect 8-0 pro record, Mokhtarian was considering leaving fighting on the backburner. That realistic outlook is obviously what has made Mokhtarian a success on the business side of mixed martial arts. But as an active participant, there was still a fire to stoke, and so he decided to travel to Vegas for TUF tryouts. Then he made the show, prompting a scramble to get his world in order for a six-week absence. 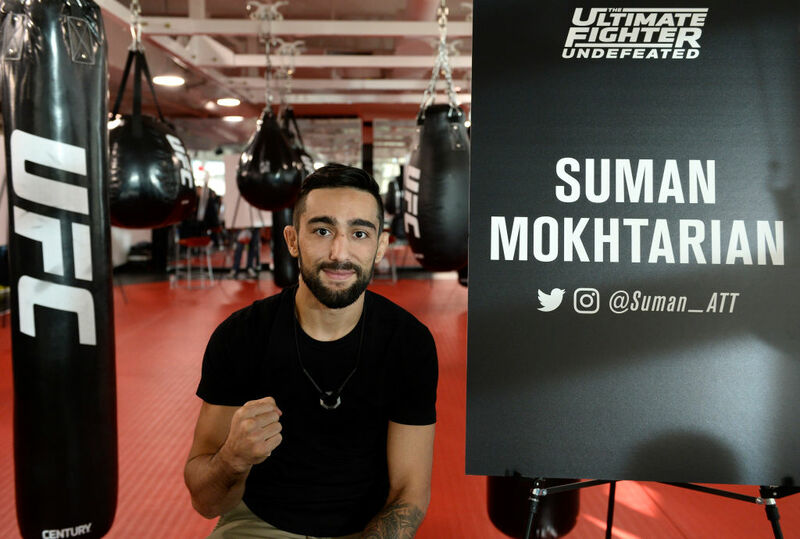 Mokhtarian’s older brother, Ashkan, is already familiar to UFC fans as a member of the flyweight roster, and if you see any of Suman’s interviews, it’s almost as if he’s more happy talking about his brother’s journey than his own. And while it remains to be seen if Suman will make his way into the UFC, seeing his brother make the walk to the Octagon for the first time in New Zealand last June is something that will remain with him forever. He’s made that walk again with his brother, as well as with strawweight prospect Nadia Kassem, establishing his Australian Top Team squad as one on the rise. Mokhtarian could be next, though, and there’s little doubt that if his day comes, those past experiences being around on fight week and fight night will help greatly in eliminating the first-time UFC jitters. Now all that’s left is getting there. On this week’s episode of TUF, Mokhtarian faces Ricky Steele. If he wins that quarterfinal fight, one more victory puts him in July’s season finale and then everything will have come together. But what of his interests outside of being an active competitor? How does he juggle being coach and fighter? And if he does get there, what should the fans expect from the hardest working man in the fight business?